This page houses a selection of secondaryresources, templates and exemplars to support planning and learning in a standards-based system. The list is not intended to be either comprehensive or authoritative, but rather to give Yukon secondary educators a brief, accessible introduction to available research and resources. Feel free to adapt the resources to suit local needs and contexts. The development of these resources is an iterative process, and the intent is to revise, improve, and expand the resources over time. We welcome anything you would like to share! ​BC's (and Yukon's) redesigned Grade 10 curriculum is finalized and available in pdf, Word and HTML in both English and French. The redesigned Grade 11/12 curriculum, is now available in full, in pdf and Word, in English and French. Thank you to those Yukon teachers involved in the development work for their help in achieving this significant milestone. We would like to thank the educators who have shared long range plans and course outlines based on the redesigned curriculum. Please let us know if you have a sample to share. ​The following three Grade 8/9 cross-curricular units have been developed by Yukon teachers and the Yukon First Nations Curriculum Working Group, to provide samples that integrate Yukon content and Yukon First Nations Ways of Knowing and Doing. We thank these Elders and Knowledge Keepers who collaborated on the development of the units, freely sharing their time, knowledge, wisdom, and ideas. Print copies of these units were given to school administrators for distribution to Grade 8/9 teachers in their schools. The BC Ministry, in collaboration with BC educators, has created a number of sample units. 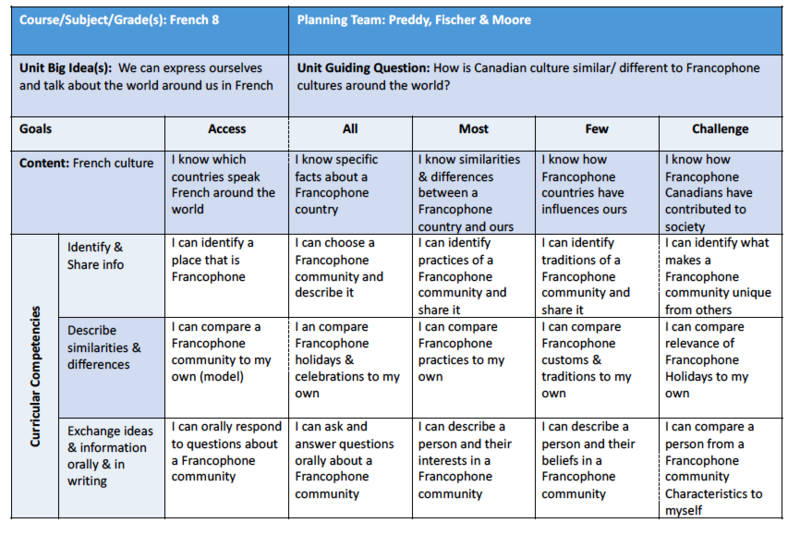 These units are shared on BC's New Curriculum website under Instructional Samples. Districts and partners in education have also developed units. Some of these samples units are highlighted below. The following curriculum comparison sheets have been created to help Yukon teachers have quick access to what's been removed, what's changed and what is new in each grade. It is our hope that this document will support teachers with a starting point to look for resources when concepts have been redistributed to other grades. Burnaby SD41 - "Learning Technologies"
Comox Valley SD71 - "Learn71"
Kamloops/Thompson SD73 - "Aboriginal Education"
North Vancouver SD44 - "Curriculum Hub"
Surrey SD36 - "Learning By Design"
Surrey SD36 - "Helping Teacher, M Garneau"